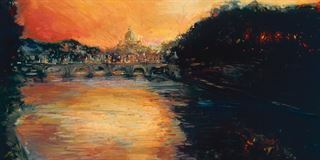 St. Peters Twilight| Painters Chair Fine Art in Coeur d'Alene, Idaho features original paintings, sculpture, prints and much more. The sun setting over St. Peter's is an awesome sight. It's so beautifu you wonder if you're dreaming - or you're wide awake and time traveling.